This high quality retro style scooter offers the very latest 21st century technology. Scooter Kymco Like 125 is definitely a looker due to the finish, build quality and retro details. The instrument panel tells you how many miles you've covered and how much fuel you have and there's also a handy digital clock. 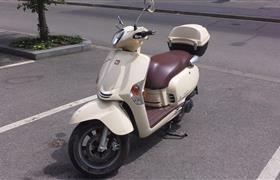 Additional features include an electric and kick-start, automatic choke, steering lock, and centre and side stands.